Over the years I’ve developed a strong affection for the portion of the California desert now referred to as the Mojave National Preserve; an almost spiritual connection to being in its domain. I can’t explain it or point to a specific cause, all I know is I just love being there. My first visit to this corner of the desert was in the spring of 1973 (long before it was a National Park) while on an exploration ride with riding buddies Casey Folks, Jack Johnson and Max Switzer. Back then whenever there was a break in the racing calendar, we would go on day rides south out of Las Vegas into this remote and relatively unknown area. At 17, these rides were my first introduction to long-distance “adventure” riding. A typical ride usually lasted from dawn to dusk and covered well over 250 miles. Since we all rode Husky two-strokes back then we would carry 2-cycle oil to mix with gas (where we could find it in various small towns and outposts along the way). Even that was an adventure, as sometimes fuel was in short supply or unavailable all together. Which reminds me of the time we had to “borrow” fuel from an unattended BLM service truck, but I digress. 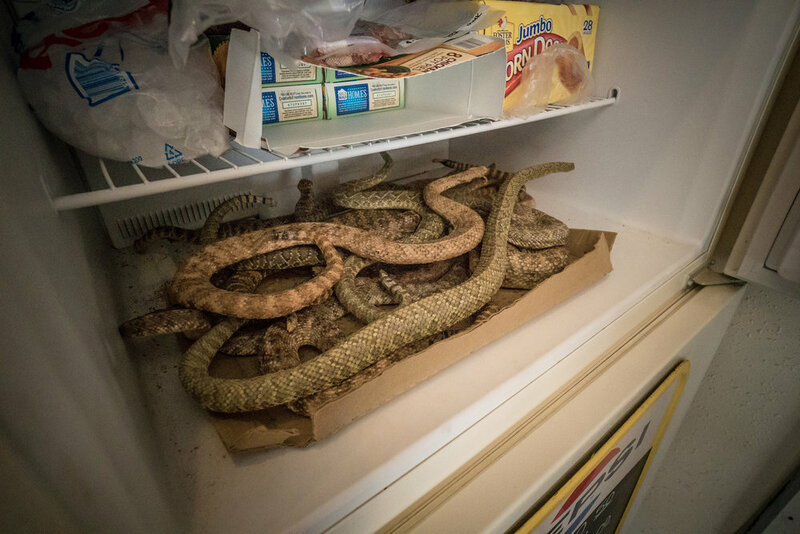 Suffice it to say, my love affair with the mysteries of the Mojave began long ago and over the years I have returned to the Preserve to recharge the batteries, replenish the soul and to share it with friends. If I had to catalogue what draws me to the Mojave Preserve, four things would be on my list. The first is the topography; the amazing landscapes/scenery. Several large mountain ranges, the Clark, Providence, Ivanpah and New York Mountains as well as the Castle Peaks and Cima Dome mean there are a wide variety of elevations, landscapes, flora and fauna. The geology of the Preserve is as varied as any place in the west, and like most places in the west, heavily impacted by volcanic activity. And as varied as the geology so is the vegetation. From low desert creosote, cactus and sage to Joshua tree forests, juniper pine and scrub cedar the desert and mountains here are far from bleak and the springtime bloom borders on iridescent. The second is the history. Old mines, forts, homesteads, railways, camps, towns and native sites provide for a rich history. The third is the climate. The fact that most of the Preserve is at 4000’ elevation (or higher) provides a welcome respite with much cooler temps than the surrounding areas especially in the spring and summer months. Last but not least, there are the people. At one time in the 1940’s thousands of people made their homes in this desert, and while most are long gone, there is still the opportunity for the chance encounter with a modern day pioneer, some rogue or wayward soul choosing to live out his/her life in this remote, isolated and harsh environment. The fact that there is some interesting background or unique story behind each of these fascinates me. As a student of the Mojave Preserve I’ve spent countless hours researching it starting with the history of the Mojave Trail; the ancient trade route used by the Mojave Indians living along the Colorado River and the coastal tribes in California. It was first crossed by a white man, Jedediah Smith in 1826. His journal The Southwest Expedition of Jedediah Smith: His Personal Account of the Journey to California, 1826-1827 is a highly recommended read for any adventure minded person. Now known as the “Mojave Road”, it represents an important chapter in the history of the west. 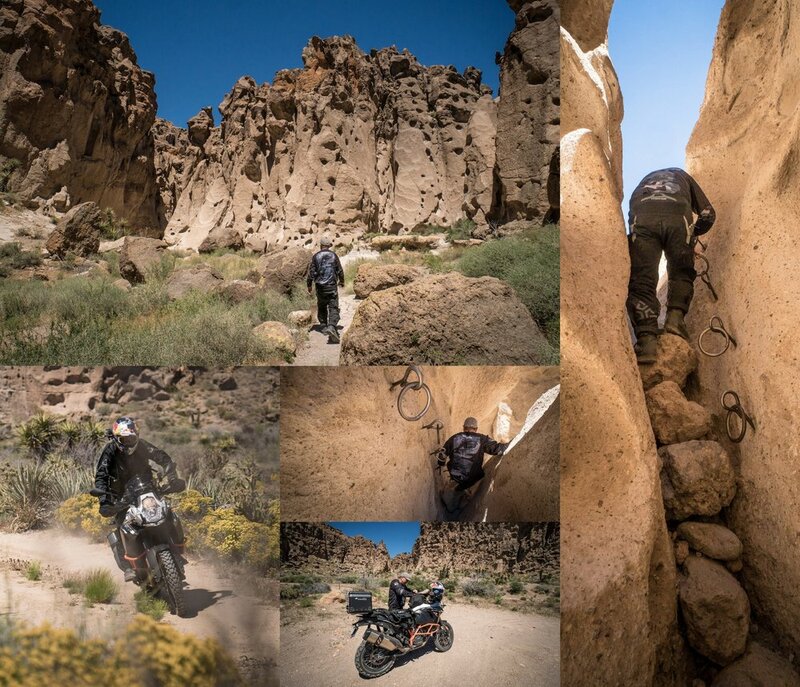 More importantly, it’s a great ride on a modern adventure or dualsport motorcycle and a great place to begin any exploration of the Mojave National Preserve. As I stated above, I just can’t get enough of this place and as I return to it over the years I continue to seek out new sites of interest, uncover new stories and gain new insights. The greatest reward is when I get to share this special knowledge with friends and fellow adventure riders. Most recently I spent four days exploring the Preserve with my new pal, Simon Cudby. We found several amazing new sites as well as visited some of my favorite haunts from the past. Here are just a few of the highlights. Description: The Hole-in-the-Wall Campground, located at 4,400 feet elevation and surrounded by sculptured volcanic rock walls, is a wonderful spot for camping. It has 35 campsites with areas large enough for motorhomes and trailers, and two walk-in tent sites. It makes a great base for exploring the rest of the Preserve. Over millions of years, eruptions spewed layers of lava and ash over this area. Uneven cooling and gases captured during the eruption formed “holes” in the rock. Erosion has enlarged these holes to create spectacular caverns. The oxidation of iron in this volcanic matter lends a contrasting reddish color to the gray background. The volcanic flows and surrounding land were eventually altered by the action of wind and rain transforming the original landscape to what you see today. The “Ring” Trail is my favorite hike leading up through a slot canyon. This area was also a sacred site for local Paiute Indians and many pictographs can be found nearby. There is a visitor center there that I highly recommend you stop by and check out. You’ll find the park rangers very accommodating even to motorcyclists. Just remember only street legal motorcycles are allowed in the park so plan to bring your best dual sport or adventure bike. Description: Originally established in 1859 by Major James H. Carrelton, 1st Dragoons Division and named Fort Beale, it served as a “camp” or “redoubt” for cavalry soldiers protecting wagon trains crossing the Mojave Road. When the Civil War ended, the desert redoubts were abandoned. Complaints from local settlers, and the fact that the Mojave Road was a U.S. mail route, prompted the U.S. Army to re-occupy the posts from 1866 to 1868. At this point, Fort Beale was renamed Fort Paiute. The biggest attraction and main reason for its existence is the natural spring that runs year round through Paiute Canyon. Located in a range of volcanic mountains, the wagon tracks can still be found embedded in the trail leading out of the canyon to the higher elevations above in Lanfair Valley. I’ve often wondered what it was like to be stationed here. It must have been a very desolate and hardscrabble life for the soldiers assigned there. Sweltering hot in the summer and bitter cold in the winter, Fort Paiute is also famous for the cavalry’s experiment with camels conducted by Lieutenant Beale from 1857-59. While the camels proved to be very effective pack animals in the Mojave, the fact that they scared the hell out of the horses, mules and other animals made them a tough fit within the cavalry’s support arsenal. All that remains today are the foundations of the fort itself along with the rock walls that served as protection during skirmishes with the Indians and as corrals for livestock. Description: “Techatticup” is Paiute Indian for “Hungry, Want Bread” and is the site of one of the most productive gold and silver mines in all of Clark County, Nevada. First discovered by the Spanish in the 1700’s, the Techatticup and Queen City Mines really took flight in 1858 and were still producing profitably as late as 1942. Because of Eldorado Canyon’s remoteness, vigilantism became the law of the land. Even murder was not a heinous enough crime to warrant the involvement of the law. In the 1870s, the nearest sheriff lived in Pioche, which was 200 miles north. It took him a week to get there, so not even a killing was a good enough reason for him to come. The isolated canyon soon became a haven for Civil War deserters, and gunfights became commonplace. An ownership and labor dispute over the Techatticup mine only fueled the fire. At one point, gunfights and killings in the canyon became frequent enough that even lawmen skirted the disputes. Camp Eldorado, a military settlement, was established to protect steamboat traffic and deter local Indians who were raiding the canyon. Blood wasn’t spilled only at the hands of prospectors. Eldorado Canyon was also home to two of Nevada’s most notorious renegade Indians: Ahvote and Queho. Ahvote is said to have murdered five victims, while Queho is believed to have killed more than 20. According to a plaque near the Techatticup mine, Queho killed his last victim, Maude Douglas, in 1919, and then managed to successfully elude sheriff’s posses for the next two decades. His remains were ultimately discovered by prospectors in a cave not far from Techatticup just above the Colorado River in 1942. Today Techatticup is managed by the Eldorado Canyon Mine Tours who have done an amazing restoration with mine tours and enough other attractions to warrant a full day just exploring the sites. Description: Built in 1924 by the Union Pacific Railroad, the Kelso Depot has been transformed into Mojave National Preserve’s principal information center with museum exhibits, historically furnished rooms, a theater, and bookstore. The area around Kelso boomed in the 1940’s with over 2000 people living in the area either working for the railroad or the local mines or cattle ranches. A great job has been done on the restoration of the original depot and its Santa Fe style architecture. It’s a thing of beauty and I highly recommend taking time to tour the museum. The nearby Kelso Dunes are some of the largest dunes in North America and although no off road riding is allowed, they are well worth the visit. Description: An amazing natural formation created by volcanic activity as recent as 8,000 to 10,000 years ago, the entrance can be made via a ladder located approximately 150 feet off the main trail. A short decent into the interior and climb down through a small anti-chamber (watch your head) leads you into the main chamber which is naturally lit through holes in the roof. 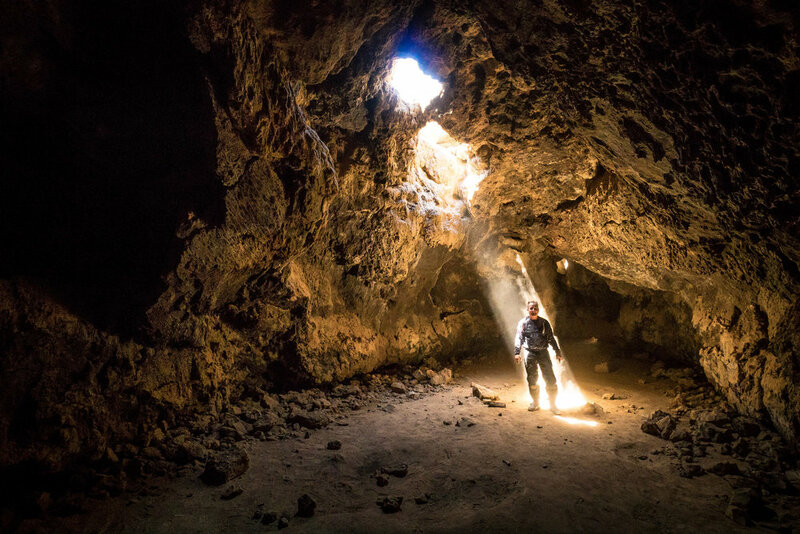 A spectacular location for photography or just a great place to rest and get out of the desert heat, the Lava Tubes are a great place to visit and are located within a much larger formation of volcanic cinder cones and lava flows that dot the area. Location: The cross stands on Sunrise Rock, a granite outcropping adjacent to Cima Road about 11.3 miles south of I-15, and 6.15 miles north of Cima on Cima Rd. Description: The Mojave Cross was originally erected in 1934 by J. Riley Bembry and his fellow WW1 veterans who homesteaded the nearby Ivanpah Mnts. It was dedicated to their fallen friends and comrades who died in the Great War. It later became a memorial to all of America’s fallen war heroes. It quickly became the site of Easter celebrations and a meeting point for denizens of the Mojave for the next 30 years. In 1999 Frank Bouno and the ACLU brought a lawsuit against the National Park Service claiming the cross violated the Establishment Clause and should be removed. The Mojave Cross had to be covered while the case was litigated. Ultimately brought before the U.S. Supreme Court after Congress had passed a defense appropriations bill to transfer the property to the Veterans Home of California so the cross could remain, the US Supreme Court reverted to the Ninth Circuit Court Decision allowing the transfer. On April 28th, 2010 Justice Kennedy wrote, “The goal of avoiding governmental endorsement of religion does not require the eradication of all religious symbols in the public realm”. Within days of the ruling and its unveiling, fanatics stole the cross. It was found two months later in San Jose, California. The Mojave Cross is now back in full view and a new plaque dedicating it as a Memorial to America’s War Heroes is placed below it. It is definitely a site worth visiting. Description: Built by WW1 vet and medic J. Riley Bembry in 1928, “Riley’s Camp” is located at the base of the Ivanpah mountains just above the “Evening Star Mine” and is surrounded by Geer Camp and several other homesteads and mines founded by a group of fellow WW1 vets in the late 1920’s and 30’s. J. Riley and his friends came to the desert to wash away the horrors and painful memories of the Great War they had all lived through. For them the desert meant rebirth. 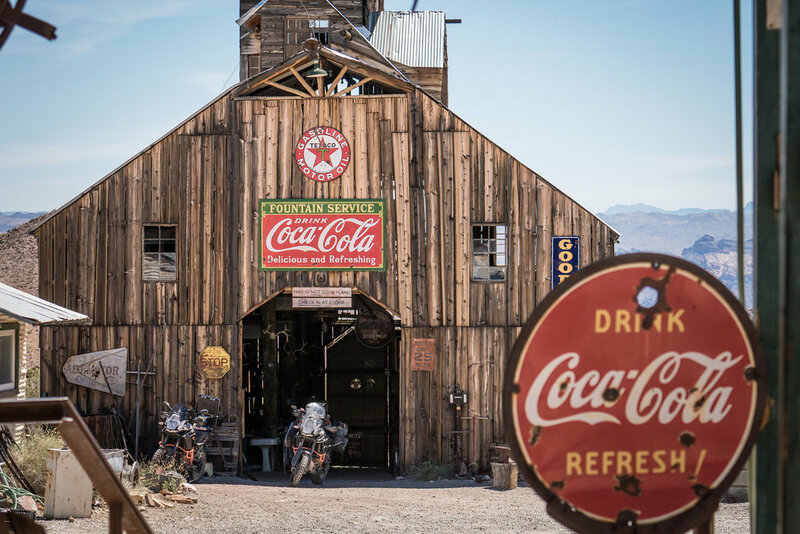 Recently restored by a group of enthusiasts, “Friends of Riley’s Camp” is a look back in time at what it was like to live a life as a pioneer and miner through the early 20th century in the Mojave. I’ve spent many hours just hanging out here, relaxing and imagining a less hectic way of life and what it must have been like for such true pioneers and especially for J. Riley who had lived through so much. The cabin is fully restored and a great location for overnight camping. I highly recommend visiting this place. My only request is that you leave it in better condition than you found it. J. Riley passed away in 1984 and is buried in the desert just a mile or so northwest of the homestead along with a couple of his fellow WW1 comrades and desert companions. If you have time, stop by and pay your respects to this true American pioneer and hero. Description: The Evening Star Mine is one of the best-preserved mines in the Preserve with the head frame and rock crushers still in place. Geological reports of the area still show great mineral reserves, but obtaining a permit within the Preserve will probably cost more in time, effort and money than the value of minerals. It began as a copper prospect but its primary yield was as a tungsten mine, although some silver was found there as well. It operated from 1935 to the late 1940’s. As many as 100 men worked in the area with a bunk house, general store and assay office once present. The main shaft as well as some of the side shafts are now sealed off. It’s a great place to stop and take a break. 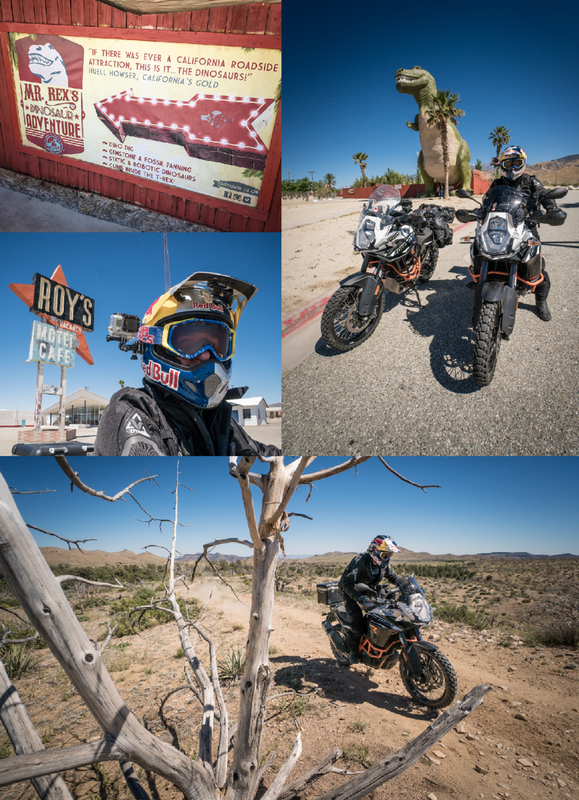 Some of the best riding in all the Preserve starts here and can be found in the Ivanpah Mountains. Description: Nipton, California is a historic town having its roots in the nineteenth century mining and ranching industries of the western United States. Its existence is mainly due to the Salt Lake Railroad and the water available at this location to service the railroad. 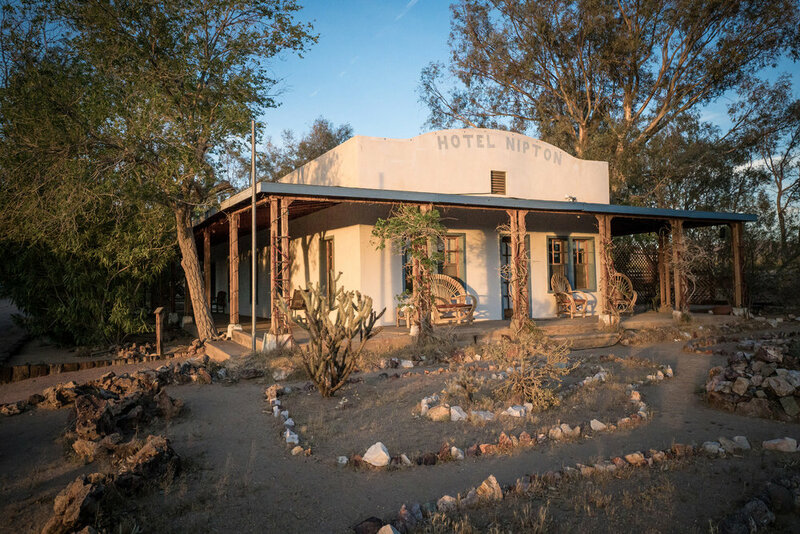 Located on the northern boundary of the Mojave National Preserve, Nipton is as authentic a desert experience as one can have. Originally built by Cornish miner Harry Trehearne in 1923, the Nipton Hotel and café provide a great retreat from the fast pace of modern life. I’ve spent many a night in Nipton, gazing at the stars and enjoying the solitude and have enjoyed every visit thoroughly. I admit it takes a little getting used to with the trains that pass by several times each night but the fact there is no television or “business center” on site is a refreshing change from normal hotel experiences. Nipton’s biggest claim to fame is that Clara Bow, the original “It Girl” of Hollywood’s silent film era (the highest paid actress in Hollywood in the late 20’s and early 30’s) often stayed in Nipton as the jumping off point to her ranch, the “Walking Box”, located 16 miles away. Nipton is a great location to serve as a base to explore the entire Mojave Preserve. There is a café there as well. Just be sure to call in advance to confirm that they are open. The best time to visit the Preserve is during the spring (March to May). The fall months also offer some great riding conditions starting in early October running through Thanksgiving. I have ridden in the Preserve over the Christmas holidays but it can be quite cold. Likewise the summer months can sometimes be accommodating it just depends on the specific weather forecast for the days you are planning to be there. In any case you can count on temps being anywhere from 10-20 degrees cooler than normal desert temps.